Get insights into the work Ashoka Fellows are doing to create a culture of wellbeing. Enter your name and email address and you’ll immediately be given a download link. Being a Changemaker means taking action. What is Social Innovation Mapping? Barriers are core components of a complex problem that, if altered, could unlock true systems change. They are not just descriptions of the problem or even of its underlying causes. Rather, they are specific, moveable, actionable parts of the problem that the social entrepreneur has chosen to tackle. 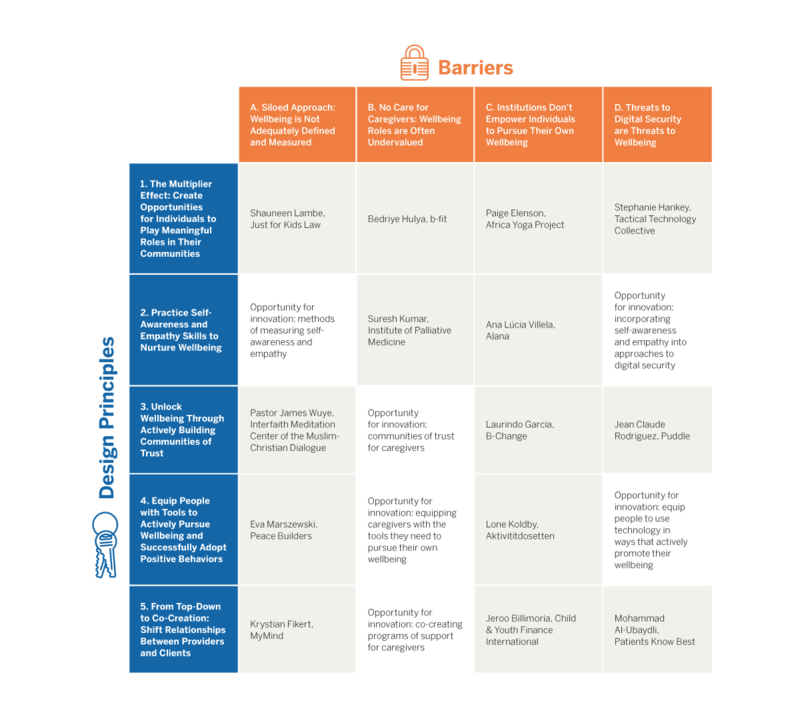 Design Principles are strategies for designing solutions that unlock system-wide change. Rather than describing a single tool or organizational strategy, Design Principles apply broadly and can inform the practices of a broad spectrum of stakeholders seeking to drive systemic change. Each Design Principle can be deployed in multiple contexts for multiple Barriers. 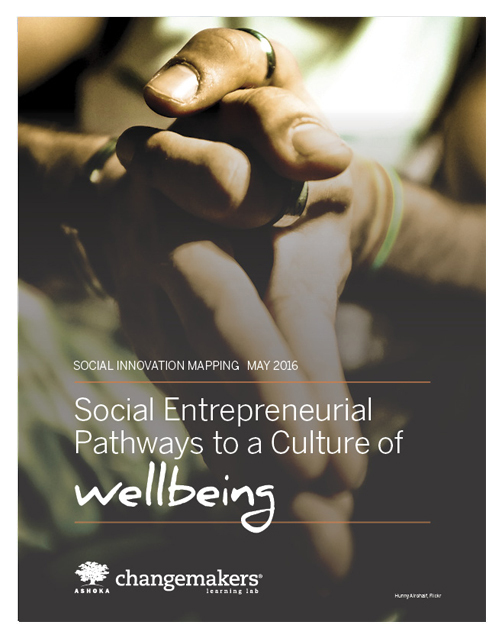 Solutions by social entrepreneurs form the heart of the Social Innovation Mapping analysis. They have been used to identify the cross-cutting Barriers and Design Principles defined above. The solutions selected for this analysis have been identified by the Ashoka Fellowship process to be pragmatic, effective, and visionary. For social entrepreneurs, wellbeing is a dynamic balance of physical, mental, emotional, and spiritual in relation to self, community and society. The common themes across all of these components of wellbeing are feeling valued and being able to act for oneself, one’s community, and others. While all people may not agree upon a single definition of wellbeing, societal buy-in to the value of wellbeing for all is crucial to fostering a culture of wellbeing. With a shared vision, individuals, communities, and institutions can work together to equip all people with the skills, tools, and supportive environments that are necessary for their personal and collective wellbeing. Inclusion into an equitable economic system that creates opportunities for all. Ashoka is the world’s largest network of social entrepreneurs with over 3,200 leading social innovators in 84 countries. Ashoka Changemakers convenes and connects high potential changemakers, their ideas, and their resources to exponentially accelerate social change so that it sweeps through systems, tipping the attitudes and behavior of individuals and institutions. Changemakers builds on Ashoka’s three-decade history to advance an “everyone a changemaker” world where people gain the skills and resources they need to collaborate on solving complex social problems.